The history of British Guiana during World War II begins in 1939, following the outbreak of war in Europe and the United Kingdom's declaration of war on Nazi Germany. Like all the other British colonies in the West Indies, Guiana gave full support to the Allied war effort by providing personnel for the British Armed Forces, land for an American military base, and raw materials for war production. Although the Guianese economy initially suffered as result of the war, large-scale infrastructural projects were undertaken, in order to optimize the production of goods for the war effort, and by the war's end in 1945 the Guianese economy had more than recovered. There were also significant changes in the country's political system during the same period, such as the legalization of political parties and the enfranchisement of women. The outbreak of World War II put the economy of British Guiana into a state of decline, due to a decrease in trading activities, which initially led to a rise in unemployment. The war also resulted in a shortage of imported goods from Britain and North America, since many merchant ships were now being utilised for military transport. The effects of the shortage of imported goods were felt throughout the country. For example, there were no new bicycle tires or inner tubes, so owners of bicycles had to improvise by using discarded pieces of rubber to patch holes in existing tires. There was also a severe scarcity of flour and petrol for vehicles, and kerosene for domestic use was rationed. The government controlled the prices of goods, especially food items, and provided subsidies for necessary imports. However, the people quickly readjusted to the situation and there was no serious lack of food since Guianese farmers produced large quantities of food crops, including rice, cassava, plantains, sweet potatoes and eddoes, as well as vegetables. British Guiana was a major supplier of high-grade bauxite to the United States during the war years. The aluminium produced from this bauxite was used by the American military for the production of aircraft. Significantly, roughly two-thirds of all Allied aircraft manufactured during the war years used aluminium made from Guianese bauxite. As a result of the demand for Guiana's bauxite, exports increased from 476,000 tons in 1939 to 1,902,000 tons in 1943. This enabled the Guianese economy to benefit greatly from the revenue obtained through these exports. The monetary worth of bauxite exports rose from approximately $2.9 million in the early 1940s to $6.7 million in 1947. This resulted from the developments in the Demerara Bauxite Company when it opened two mines at Mackenzie, thus creating more jobs in that sector for the Guianese people. At the end of the war, the Guianese Treasury had a surplus of more than $6 million, mainly due to the revenues earned by the bauxite industry. The United States obtained rights to locate military facilities in British Guiana as part of the Destroyers for Bases Agreement with the United Kingdom in 1941. On 14 June 1941, the first United States Army forces arrived to survey land for a bomber airfield near Georgetown. Atkinson Field was built 28 miles (45 km) from Georgetown on 68 acres (28 ha) of land formerly known as Hyde Park, on the Demerara River. The forest was cleared and hills were levelled and a long concrete runway was constructed. On 20 June 1941 the airfield officially opened with the activation of a weather station. The station was named after Lieutenant Colonel Bert M. Atkinson, a United States Army Air Service World War I aviator. Colonel Atkinson was the commander of the 1st Pursuit Wing on the western front in 1918. Colonel Atkinson retired from the Army in 1922 after a distinguished career and died on 27 April 1937. The mission of the station was the defense of the colony against German U-Boats. The airfield was also a major staging point for American aircraft crossing the Atlantic Ocean heading to the European Theatre on the South Atlantic transport route. Aircraft supplied to the British forces by the United States were flown to Atkinson where they were turned over and ferried to North Africa. With the discovery of bauxite deposits in northeast Brazil 1943, the mission of the airfield was expanded to protect the coastline of northeast South America and prevent any submarine landings by Axis forces on the continent. In the archival footage above this film shows details of the production of aluminum. In English Guyana Brazil and Dutch Guyana there were large deposits of bauxite that guaranteed the production of thousands of aircraft by the USA. 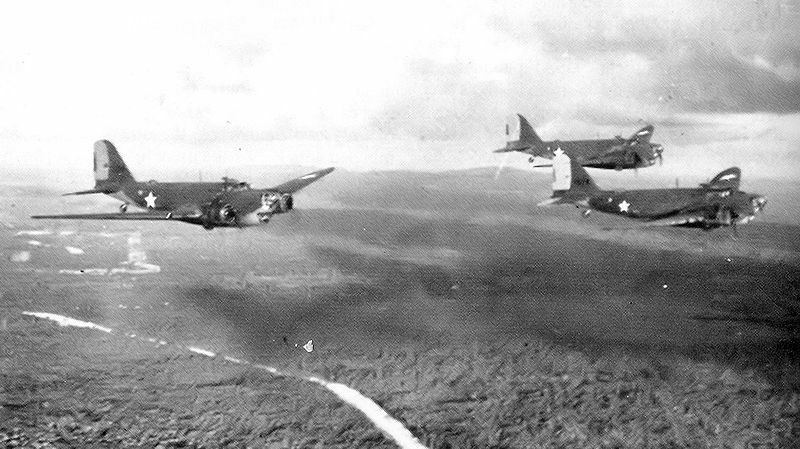 United States Army Air Forces 430th Bombardment Squadron 9th Bombardment Groupwas assigned to Atkinson field from 4 November 1941 to 31 October 1942 flying anti-submarine sorties in Douglas B-18 bombers. The 430th was replaced by a detachment of the 35th Bombardment Squadron (25th Bombardment Group) from 1 November 1942 to 7 October 1943. 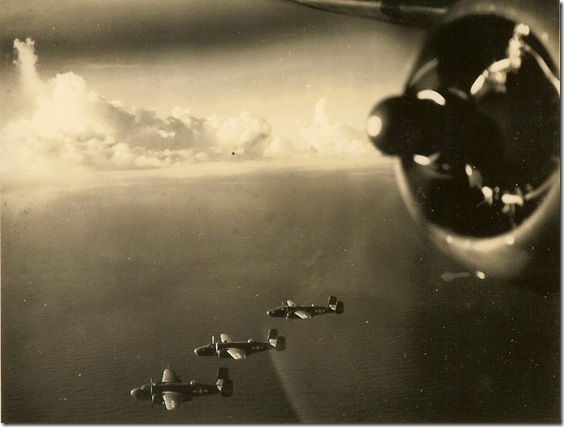 After the detection of U-Boat activity was taken over by the United States Navy, the 91st Reconnaissance Squadron (344th Reconnaissance Group) was assigned to the airfield during 1944 and 1945 flying the F-10 photo-recon version of the B-25 Mitchell bomber on various mapping missions. The United States at first remained neutral in the war but agreed in September 1940 to provide fifty old World War I-era destroyers to Britain. In return, Britain leased to the United States a number of sites stretching from Newfoundland in the north to Guiana in the south. These locations, which were to be used as American military bases, were leased for a period of ninety-nine years. Even before the United States entered the war in December 1941, the Americans commenced the building of an air base at Hyde Park on the east bank of the Demerara River, twenty-five miles south of Georgetown. The forest was cleared, hills were levelled, and a long concrete runway was constructed in 1941. The air base was soon named Atkinson Field, after the base commander Major Atkinson. 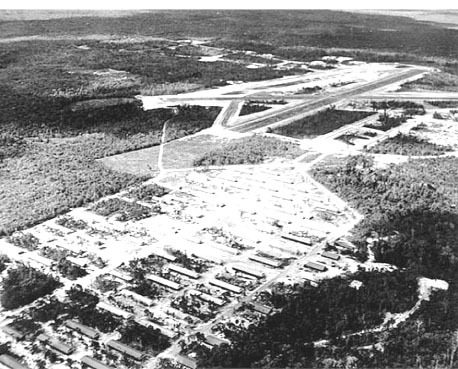 Later in the year, the American 44th Reconnaissance Squadron was stationed there to protect the base, and to make regular air patrols between Panama and Guyana. Around the same time, a huge cigar-shaped American blimp passed along the coast of Guyana daily to keep a lookout for German U-boats. Shortly after opening, American aircraft began arriving at Atkinson with munitions and other goods, which were then ferried by other planes across the Atlantic Ocean to West Africa. From there the supplies were transported to North Africa for the British forces fighting against the Germans. War planes purchased by the British from the Americans were also ferried to North Africa through Atkinson Field.